Did you know that according to Gallup poll data people who use their strengths are six times more likely to be engaged in their work and three times more likely to say they have an excellent quality of life? One important step in the process of identifying a career based on your student’s strengths is choosing the right college major. Is your high school student undecided when it comes to choosing a college major, or does he know what he wants to do? Selecting college majors and careers is exciting, but often involves uncertainty and questions. 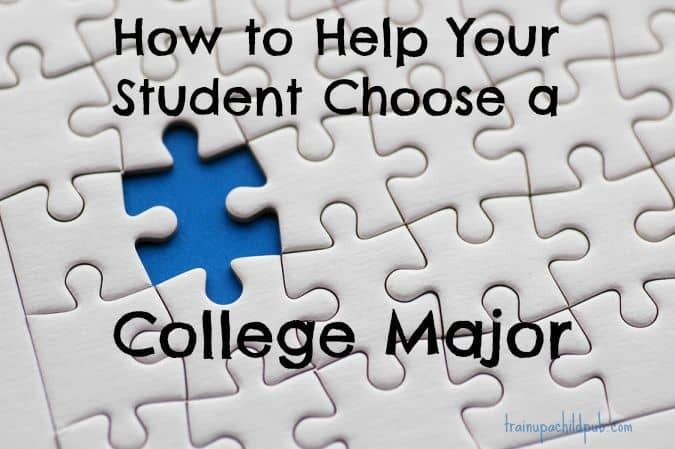 However, there are ways you as a parent can assist your student in selecting a college major. Begin by seeking God’s direction as you and your student explore his God given strengths, values, and interests. Strengths involve skills, qualities, and personal characteristics that come naturally. They are part of the way God designs us. In what area does your student naturally excel? Strengths can be hard for us to identify in ourselves so it can be helpful for your student to ask others to assist him in discovering strengths. What do friends, family members, and authority figures respect and appreciate in your student? Look for places of excitement, energy, enthusiasm, and motivation. Working in areas that utilize our strengths is motivating and energizing. What does your student love to do? What are his favorite courses in school? Think about activities where he has been so engaged that he lost all track of time. Have your student describe his ideal job. What would he find joy in doing each day? Also ask him what he doesn’t enjoy doing. Being aware of what you don’t enjoy doing is helpful in giving direction. Is it realistic that this interest can support your student, or is it more appropriate as a hobby? Even if it is better suited as a hobby, there is often an element or theme of that interest that can be part of a college major or future job. What matters most to your student? Core values are traits or qualities that represent an individual’s highest priorities, fundamental beliefs, and core driving forces. Knowing your core values makes decision-making easier and more effective. When we are in alignment with our core values we are living authentically and stress and frustration are reduced. As you approach this season in your student’s life, be encouraged. Explore together and have fun discovering how God uniquely created your student. Approach this with a learner’s mindset and remember that your student will continue to acquire and build skills throughout his life. Encourage your student to also seek God’s direction. He created your child with specific interests, values, and strengths and will lead you both as you seek His guidance. What have you and your student discovered as you explored college majors? Dorita Deierlein, former home schooling mom, now life coach, partners with students, young adults, parents, and empty nesters as they navigate life’s transitions and seek God’s next best step. To find out more about how Dorita can assist you contact her at dorita@doritalifecoaching or visit her website http://www.doritalifecoaching.com. Dana, can you contact me? I’m needing to purchase curriculum. Of course, Candice ~ emailing you now.